There’s a difference between a classical pianist who sits down to play Beethoven’s Moonlight Sonata and a jazz pianist with hours of improvisational experience who is comfortable making up a melody in front of an audience. The difference, it turns out, can be seen as well as heard. Seen by a brain scanner, that is. The effects of long-term musical practice on the brain are well documented, but scientists have only begun to explore how the type of musical training can change the neural effects. In a study out this week in the Journal of Neuroscience, Ana Luísa Pinho and colleagues set out to investigate the neural basis of musical creativity, or improvisation. The scientist put 39 professional pianists into a MRI scanner and assessed brain activity and connectivity as the pianists improvised tunes on a keyboard placed on their laps. The musicians also filled out a questionnaire on the number of hours they rehearsed classical music and practiced improvisation in an average week. 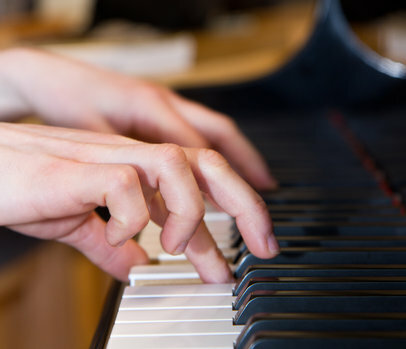 Pinho and her colleagues found that the more a musician practiced improvisation, the greater the connectivity between certain brain regions was as they improvised. The highly connected brain regions were areas that have to do with planning, abstract reasoning, and movement control – specifically, the dorsolateral prefrontal cortex, the presupplementary motor area, and the dorsal premotor cortex. This result supports the idea that there may be no specific brain region that generates creative thought: rather, creativity may be generated by a distributed network of brain regions working in symphony. Surprisingly, at the same time that the connectivity between these areas increased, the overall activity of prefrontal brain regions decreased according to how much a musician had practiced improvisation. This decrease in the activity of areas used for planning and cognitive control suggests there there is a degree of automation during extemporaneous playing when one is practiced at it. This may reflect the subjective experience of improvisers – that when they are performing, they are not thinking hard, but are in a state of flow. The improvisational playing feels automatic, despite being unique and creative. Improvisation requires a musician to build up a library of musical phrases and motifs over time, to be accessed when playing and put together in new and expressive ways. Creativity requires training. This work suggests the intriguing possibility that creativity can, to some extent, become automatic to the brain. Categories: Original Research Blogging | Tags: creativity, music, Prefrontal Cortex | Permalink.